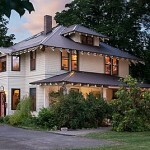 The Hood River BNB was built in 1909 home and has plenty of room for you, your gear, your appetite and your resting needs. You will be able to find a quiet area, nook or hideaway for reading and relaxing within the home and yet be within walking distance of town and all that it has to offer. In addition to 4 large bedrooms and our Lending Library, Hood River BnB has a media room with TV, VCR and DVD, a PC/Internet station with stored links for relevant wind, weather and mapping services, WiFi, plenty of room for all your gear, a river-facing deck, lots of new covered storage space for gear. Rooms are spacious, comfortable, functional, have great views. The beds and linens are comfortable and should ensure a good night’s sleep. 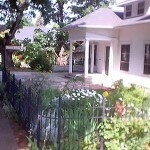 We provide the space for relaxing and the local area provides the beauty. Christmas, Holiday Markets and the Innkeepers of the Columbia Gorge Bed and Breakfast Association invite you to celebrate the season and festivities with us. Some of our innkeepers really deck the halls. Some have a more subdued style. Hood River, Oregon, becomes a snow globe, a true old-fashioned small town holiday spot. The historic and beautiful downtown is adorned with holiday lights, bows and cheer. Mosier Country Christmas Fair is Dec. 5 and 6 from 10 a.m. to 4 p.m. Over 60 vendors, food and drink and tree sales. Admission is $2 per person and 1 can of food ( human or pet). Kids under 12 are free. Photos with Santa from 11 a.m. to 3 p.m. There is also a book and bake sale at the Mosier Library (2 blocks east of the school). and the rest of our community.